Post challenge: I couldn't be more happy with my favorite from Rachel( RkT)! She was a direct inspiration when I shot this and post processed it. It was also influenced by nick's( nixter) photos of beetles and old cars. Thanks for all the votes and comments. All appreciated. King Kong attacks later on! very RKT in a homage kind of way! I didn't see this before - its a great concept piece. and...Kong is a lousy drunk... ha! Way ta go, Joe! This really is a GREAT image! Very vintage looking. Nice to see this was yours. I love the gorilla in the background, the sepia like tone and the vintage feel of the photo. I can't get over how cartoony that car looks. Terrific effect. This picture makes me Feel So Good. my favorite parts in the photo are the reflections of the light on the car. Nicely caught. Nice composition. And the blurry people gives the shot a nice sense of movement and activity. Awesome shot and processing.Love the wide angle. love the feel of this photo! I love the processing on the car, but find the gorilla distracting. 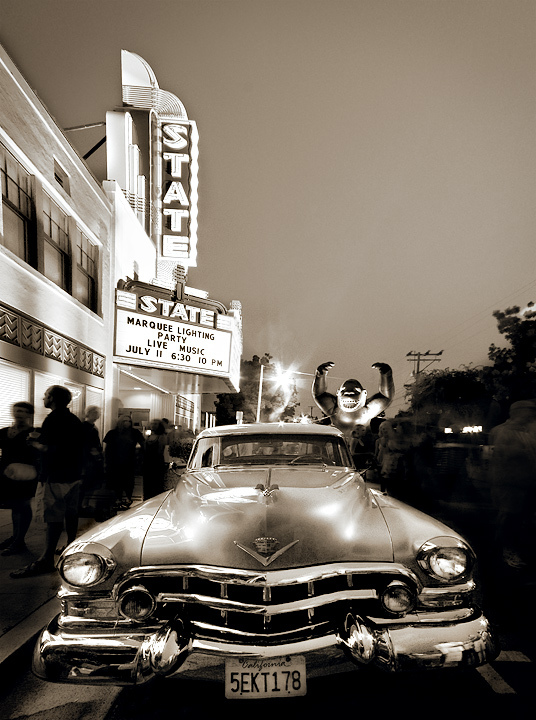 At first I thought that was the State Theatre in Austin but then realized it's in CA. I like the color range. Proudly hosted by Sargasso Networks. Current Server Time: 04/20/2019 02:33:48 PM EDT.